A liaison office, also called a representative office, is a flexible structure adapted to foreign companies who wish to establish themselves in France, so that they can test and study the French market beforehand, as well as prepare for a permanent installation in France. Contrary to a subsidiary or a branch, the principle characteristic of this office is that it does not conduct any commercial activity in a legal sense. Therefore, the liaison office in France is not established in order to enter into agreements on behalf of its parent company; nevertheless it gives the company an edge because it allows the company to conduct initial meetings and make initial contacts (prospects, suppliers, partners, sales representatives…), in order to conduct studies of the market, to ensure its communication and publicity, and/or to participate in trade shows. A foreign company can either recruit an employee or send an employee to France in order to represent it with its representative office. In the context of hiring an employee in France, taxation on employees and social obligations of any employer shall be applicable. The company will be subject to social security contributions and employer contributions, and shall pay any employer and employee contributions owed in accordance with the employment of salaried staff under the French Social Security System and unemployment insurance, as well as respond to its obligations concerning the required system for supplementary pension. There is another form of representation, which corresponds to the hiring of an employee who, by his/her employee status, has all the social guarantees of any salaried employee in France. The objective of the representative will be to develop the image of the Parent Company in France and to gather information, which will allow the company to put implement a commercial strategy on the prospective market, but in no case will the company enter into the completion of commercial agreements. The main advantage rests in the flexibility of this type of structure; the representative office does not need to have its own legal status in France. Therefore, registration of the liaison office with the Registry of Trade and Companies is not required. A declaration of existence shall be made with the center of formalities for companies of the appropriate chamber of commerce and industry. If there is no registration requirement with the Registry of Trade and Companies, it may be required to have a K-bis certificate and therefore to be registered, which would only be for relationships with its suppliers. In this case, a registration will need to be carried out. Thanks to the flexibility of this type of structure, there is also the benefit of being able to complete the process quickly and without fees. On one hand, a liaison office is not held to keep the books and is not subject to corporate tax, nor to VAT. On the other hand, it must respond to legal and social requirements if it employs salaried employees. Another benefit that is often expressed by foreign companies who wish to establish themselves in France is that they don’t have to make expensive investments connected with the costs of establishing and operating a company in France. 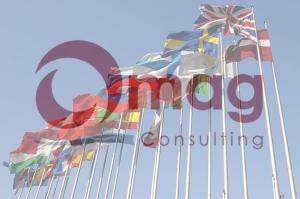 Omag Consulting, a specialist in outsourcing, is a company who provides support services to foreign companies who wish to establish themselves in France, with a strong emphasis on the outsourcing of human resources functions, as well as a thorough and complete knowledge in terms of legislation and employer requirements regarding salaried employees.